This is the first printing of the full 10 volume set of THE MOUNTAIN WORLD produced by The Swiss Foundation For Mountain Research. The set was published from 1953 to 1969 in New York and London. 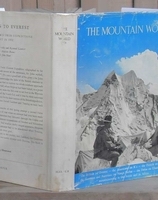 These excellent volumes include firsthand accounts of the first ascents of most of the 8000m peaks, pioneering ascents in the Karakoram and Himalaya, major climbs in Alaska and remote ranges worldwide. Each volume is illustrated with excellent photographs and maps, including some folding photographic panoramas and maps, notably the superb Bradford Washburnn topographical map of Mount MacKinley included in the pocket at the end of the 1960 issue. CONDITION: All volumes are complete with original dust jackets. Some of the jackets have rubbing and chips (see photos) and several have price-clipped flap corners. The book covers are clean and not rubbed and not faded. NOT Ex-Library. Previous owner gift inscription on front pastedown of 1953 volume, previous owner name on FFEP of 1956/57 volume, previous owner custom bookplate on front pastedown of 1966/67 volume. Otherwise, there are no previous owner marks or writing on any pages of the volumes. Pages are bright and clean, bindings are tight, complete set with all foldouts and rear pocket maps present. Price: SOLD. NOTE: Please ask if you require individual issues of The Mountain World. We have copies of most issues in varying condition/prices.